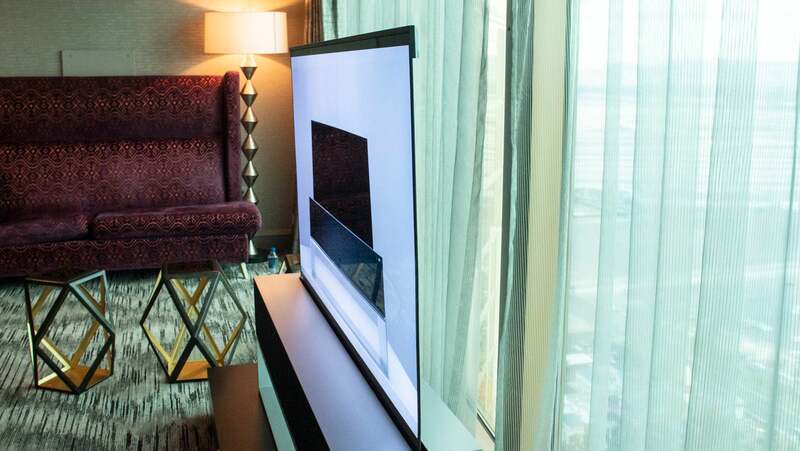 It’s hard to imagine CES without TVs, and this year that almost happened. This is not to say there weren’t any TVs in Las Vegas. There were a lot! There were 8K TVs, OLED TVs, QLED TVs, big TVs, small TVs. But it’s hard to explain how they’re meaningfully different than the fancy TVs we were excited about at CES last year. Well, for one, you can buy some of the coolest things now. We also saw completely new TV tech rear its head. And everything is big, big, big. Let’s start with the TVs you can buy. Several top manufacturers announced an 8K that was coming to market. Samsung announced an expanded lineup of its Q900 QLED 8K TVs which start at 65 inches (for $5,000/£3,920; UK pricing and availability TBA) and go all the way up to 85 inches (for $15,000/£11,770; UK pricing and availability TBA). Like the models announced last year, these TVs use artificial intelligence to upscale conventional content so that it looks like it has 8K resolution. Sony announced a new 85-inch and a massive 98-inch 8K LED TV for its top-of-the-line Master Series. LG announced a hulking 88-inch 8K OLED. Pricing isn’t available for these models yet, but we can assume they’ll be right up there with Samsung in the many thousands of dollars range. Something to remember is that the there’s an extreme shortage of 8K content at the moment, which means that folks will definitely be watching a lot of upscaled HD and 4K content on these fancy TVs. It’s not like you can go to the store and easily buy an 8K Blu-ray edition of Venom for your brand new ultra expensive TV. One interesting development we saw at CES, however, was a new line of QLED 8K Roku TVs made by TCL. TCL is a fast growing TV brand that’s best known for selling reasonably high-quality hardware for unreasonably low prices. The company’s 6-Series was an incredibly good deal for the money. So the idea that TCL is getting into the 8K game and partnering with Roku to do so is intriguing. There’s a chance these might actually be affordable TVs. Now that Roku is beefing up its content game with the ad-supported Roku Channel and a dedicated channel for 4K content, the operating system could see an upgrade that makes finding 8K content easy. Suffice it to say that 8K is still somehow underwhelming, but not because the TVs don’t look amazing. The content question is a big one, and it’s worth pointing out that there’s still a lot of improvements that could be made to existing 4K TV technology like HDR and wider colour gamuts. Furthermore, most of the 8K TVs we saw this year are way too gigantic to fit in the average person’s home. Who has space for a 98-inch display in their living room?! Rich people probably do, and the early adopters among them are probably the customers these TV companies are targeting. There’s some fascinating tech on the horizon for the future for TVs. Samsung, for instance, showed us more details about its MicroLED technology which is a major improvement to display technology. It uses self-emitting pixels like OLED displays but is based on traditional LED technology, so it’s brighter and more energy efficient. 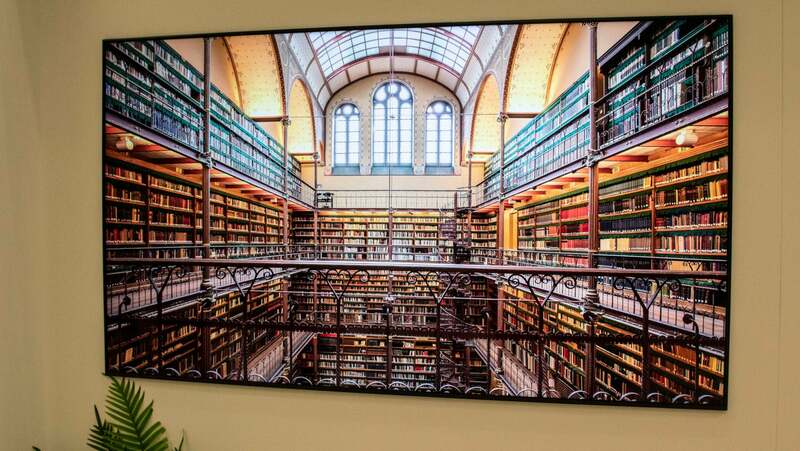 In principle, MicroLED displays could be scaled up to enormous sizes like the 219-inch TV Samsung showed, but it can also be scaled down and stretched out to unusual aspect ratios. Samsung showed what this might look like with a modular concept called Windows. While you can order the Wall (for around $100,000/£78,460; UK pricing and availability TBA), the modular stuff is still a concept for now. Speaking of concepts, LG will now be selling that wacky rollable OLED concept that it announced at CES last year. That’s literally an OLED display that rolls up in a box so that it disappears when you’re not watching it. That’s also going to be an expensive one. In a demo, LG told Gizmodo that its weird new rolling TV would likely cost more than its new 8K models, and even LG’s current OLED displays go for several thousand pounds. So it’s safe to bet that this is another rich person toy, too. Then again, this tends to be the trend at CES. Companies want to show off their latest technology and get people excited about a future that they might not be able to enjoy for a few years. (Unless they’re rich, of course.) Meanwhile, as far as TVs are concerned, we’ve already experienced the slow parade of 4K TVs being released when no 4K content existed, and now, there’s lots of 4K content out there. You can even stream it on Netflix in 4K. This is all to say that 8K might be a technology that doesn’t mean much to the average person now, but in a few years, it could be the industry standard. If you decide to get one, just make sure it’s big enough to appreciate all those pixels. That blank wall in your living room was bothering you anyway.